Clockwise from bottom left: Long Beach Media Collaborative Project Manager Wendy Thomas Russell, Press Telegram Senior Editor Thomas Bray, Long Beach Post News Editor Stephanie Rivera, Director Dennis Dean and Features Reporter Jason Ruiz, Long Beach Business Journal Special Assignment Reporter Karen Robes Meeks and Press Telegram Reporter David Downey. Photo by Asia Morris. In a major effort to cover issues important to the Long Beach community by leveraging the power of local journalism, four news agencies—the Long Beach Press Telegram, Long Beach Post, Grunion Gazette and Long Beach Business Journal—accepted the challenge to work together for the first time under the umbrella of the newly-formed Long Beach Media Collaborative. Initiated in August 2016 by Long Beach Community Foundation President and CEO Marcelle Epley, the collaborative’s first series exploring the causes and effects of the digital divide in Long Beach and around the world, called “Strengthening the Signal,” was launched October 20 of this year. The idea of a media collaborative isn’t new, but it is for Long Beach. To find out whether the LBMC’s participants have so far deemed the project a success, and before the group has gathered to discuss this among themselves, the Post interviewed Press Telegram Senior Editor Thomas Bray, Long Beach Post Director Dennis Dean, Long Beach Business Journal Assistant Editor Samantha Mehlinger and Gazette Newspapers Executive Editor Harry Saltzgaver. Described as a “new and unusual” arrangement by Bray, most were impressed by all participants’ ability to function cohesively as a group, despite being accustomed to the daily race of trying to beat each other to local stories. Most commented that the experience was a positive one, and presented an opportunity to meet and learn from other professionals they never would have normally approached. 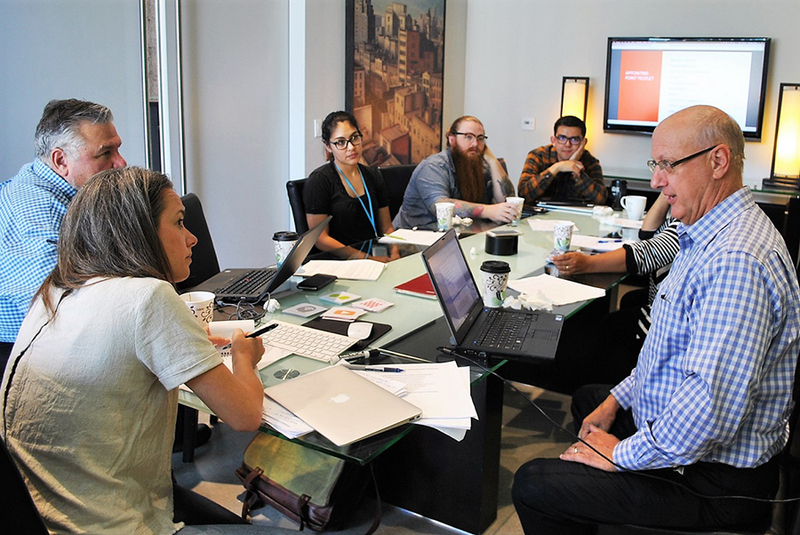 “The Long Beach media landscape is competitive, but I think journalists all want the same thing—to produce good work—and focusing on that goal made the collaboration successful,” Dean added. Epley voiced that if the LBMC were to work on any projects in the future, it would be critical to have a point person, and entertained the idea of identifying more resources to make sure the group communicates with that individual, whether they be someone from outside the publications or someone working within. In this case, the project manager was former Press-Telegram reporter Wendy Thomas Russell. Russell added that selecting the digital divide as the topic for the LBMC’s first project was strategic, alongside its importance to the Long Beach community. Most of the participants agreed that the news agencies collaborating actually bolstered in-depth local journalism; some reporters were able to share valuable resources with each other for the sake of covering the important issue of the divide, a practice practically unheard of among competing publications. Others were able to learn from each other’s differing experiences in the field. “I think journalism in Long Beach has always been particularly strong, but I do think this kind of collaborative model allowed the reporters, who are used to operating under the stresses of the daily digital news cycle, to break down a large issue into smaller parts they could really focus on and drill down into to give this issue the attention it deserves,” Dean said. One criticism included the length of the series, which ran over a period of seven weeks. Saltzgaver said readers of the Grunion Gazette began to lose interest. Another involved the scheduling of meetings being prioritized equally for all publications, as each adheres to differing programs and practices, as well as the resources provided by the Knight Foundation being allocated more equally depending on each entity’s share of the workload, which varied throughout the series. Mehlinger suggested that any future LBMC projects be organized on a longer timeline, not only to accommodate differing schedules but also to generate more of a buzz prior to the project’s debut. However both Dean and Epley were in agreement that plenty of people have been talking about the digital divide, while Bray noted that engagement in journalism is certainly an evolving concept. When asked if this collaborative model could be replicated in other cities, Saltzgaver commented positively on the attitude of Long Beach’s news groups. The results of the community foundation’s Around the Table citywide discussion will be published likely after the first of the year, where nearly 3,000 locals participated in September to discuss what can be done to collectively improve Long Beach. The number one issue raised was housing and homelessness, Epley said.